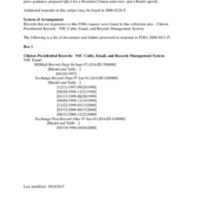 This collection consists of the records of Bruce Riedel, Senior Director of Near East and South Asian Affairs, National Security Council (NSC), 1997-2001. Specifically, these are Riedel’s records that pertain in whole or in part or a combination of the following issues: the Taliban, Afghanistan, Pakistan, Mullah Omar, Usama bin Ladin (UBL), al-Qaeda or Iraq and terrorism. The majority of these records in this collection are closed for National Security.